Landlord-Tenant Eviction Action in New York – Holdover or Non-Payment? Our firm frequently represents both landlords and tenants in eviction actions. Unlike many law firms who specialize in only representing landlords or only defending tenants, we recognize that valid legal issues and valid defenses may exist for both the party owning a given property and the party who may be renting the property. This blog post will discuss the basics of an eviction action, and may be viewed from the perspective of either a landlord or a tenant. Eviction cases in New York State are classified as either holdover actions or non-payment actions. They cannot be both. When the landlord (who is usually called the “petitioner”) decides to file a petition for eviction in the appropriate court, the landlord’s attorney must decide whether the case is a non-payment action, or a holdover action. A non-payment action is an action for eviction based on the tenant’s failure to pay rent as due. The rent due may be based on a written lease, or simply an oral agreement between the landlord and the tenant. For example, a tenant enters into a lease to rent a house for $6,000.00 per month. The tenant then does not make the rent payments as due. Our attorneys will usually advise the landlord not to proceed with a non-payment action until several months’ rent has accrued. The reason for this is that a tenant may always end a non-payment action by making payment. Once any and all rental arrears are paid by the defaulting tenant, the non-payment action will be dismissed by the Court and the tenancy will continue. Non-payment actions may also be based on non-payment of expenses other than rent. For example, a commercial lease may require the tenant to pay a particular share of real estate taxes in addition to the rent due. The tenant then fails to make the tax payments. The landlord may bring a non-payment action, even if the rent has been paid to date. Of course, as in any non-payment action, the tenant can cure and have the case dismissed by paying the arrears due. 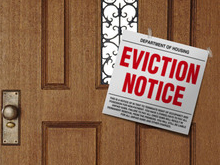 The other type of eviction action is known as a holdover. A holdover action is one in which a tenant’s lease has expired, but the tenant has not vacated the premises. The landlord must bring a holdover action in order to evict the tenant in question. For example, a tenant has a written lease for one year, which ends on December 31, 2015. The tenant remains in possession after the expiration of the lease. The landlord must bring a holdover action against the tenant. It is not a non-payment, as the tenant may or may not have made all of their rent payments under the lease in question. Holdovers may also involve tenants without a written lease. Tenants without a written lease are usually considered month-to-month tenants. This means that by paying the rent for a given month, the tenant cannot be evicted in that month. In a month-to-month tenancy, either party (landlord or tenant) may terminate the arrangement on thirty days notice. The landlord is legally required to give notice to the tenant that the tenancy is terminated and that they must vacate within thirty days. If the tenant does not vacate after thirty days, the landlord can then bring a holdover action in the appropriate court. A tenant who stays after the end of a written lease may also be considered a month-to-month tenant under certain circumstances. Using the example above, a tenant has a written lease ending December 31, 2015, for $6,000.00 per month. All of their rent payments are current. On January 1, 2016, instead of vacating, the tenant pays the landlord an additional $6,000.00 in rent, which the landlord accepts. This now creates a new, month-to-month tenancy between the landlord and tenant, which can only be terminated on thirty days’ notice. Our firm has extensive experience in representing both landlords and tenants in both holdover and non-payment proceedings, and welcomes all inquiries.